Elizabeth Denbow was born in 1827 at Ohio, USA. Not sure about birth date. Might have been twin of James, but Signe's research showed she was born in Ohio and James in Maryland. Signe had James as born in 1824; Graves record says 1827 -- same year as Elizabeth. Could, of course, have both been born in same year and not be twins -- but not too likely. Her married name was Wise. She married William N. Wise in 1845 at Monroe, Ohio, USA. Her married name was Dillon. Elizabeth Denbow married Hamilton Dillon in 1847. Her married name was Fisher. Elizabeth Denbow married Joseph Fisher in 1851 at Monroe, Ohio, USA. Elizabeth Denbow died in 1890 at Monroe, Ohio, USA. Elizabeth Denbow was born in 1774 at Harford, Maryland, USA. She married Andrew Thompson in 1794 at Maryland, USA. It is unclear if this Elizabeth Denbow is the daughter of this John Denbow, or another John Denbow in a related line. I've put her here because her age is appropriate to be the daughter of this John Denbow and no others that I've found a record of. See Thompson Genealogy, pp. 1, 3. Her married name was Thompson. Elizabeth Denbow died in 1848 at Harrison, Ohio, USA. Elizabeth Denbow was born on 31 March 1861 at Rinard's Mills, Washington, Ohio, USA.1 Her married name was Starkey. She married William Starkey, son of Edward Starkey and Sarah (? ), on 17 January 1884 at Ohio, USA; Some sources give 21 Feb 1883 as marriage date, but this may have been to obscure that her first child was born just a few months after the marriage.2 Elizabeth Denbow died on 16 October 1932 at Ohio, USA, at age 71.1 She was buried on 16 October 1932; Valley Cemetery,Washington,Ohio,USA. Elizabeth Jane Denbow was born on 4 May 1918. Her married name was Lightner. Jane D. Lightner died Tuesday, September 30, 2008 at Kingston of Ashland. She was born May 4, 1918, in Ashland, to Clement Steven and Pauline I. (Grindle) Denbow. She loved her family, friends, music and children. She was a graduate of Ashland High School and became a secretary in the Ashland City Schools, serving at Pleasant and Lincoln Elementary schools, Ashland Junior High School (the old high school) and as secretary to the Assistant Principal at Ashland High School. She then moved on to Ashland College as a secretary in the music department. In 1970, she became Executive Secretary-Treasurer and Ticket Manager for the Ashland Symphony Orchestra for sixteen years under director Harold Weller. Jane was a longtime loyal member of Emmanuel United Methodist Church and the Crusaders Sunday school class. She played organ for the church and served as an instructor for the acolytes. She was also a member ofthe Altar Guild and was a faithful servant of God. Jane is survived by two daughters, Cynthia Yeater of IN, Cathy (Richard) Henry of Mansfield; four grandchildren, Steve (Shannon) Yeater, Kellie Lawler, both of IN, Christin (Eric) Lehnhart of Galion and Robyn Henry of New York City; five great-grandchildren; two brothers, Joseph (Patricia) Denbow and Richard (Shirley) Denbow, all of Ashland; many nieces and nephews; and a host of wonderful friends whom she will be waiting to greet in Heaven. She was preceded in death by her husband, James B. Lightner, whom she married August 16, 1941. Friends may call Saturday, October 4, 2008, at Emmanuel United Methodist Church, from 10 a.m. until the time of the service at 12:00 noon with Rev. John Guliano and Rev. Ignatius David officiating. [S46] Joseph Denbow, "Joe Denbow Email," e-mail to Carl J. Denbow, Oct 2008. [S46] Joseph Denbow, "Joe Denbow Email," e-mail to Carl J. Denbow, Oct 2008, Joe Denbow said that his sister died after a difficult six week's illiness. He reported that the funeral was Saturday, 4 Oct 2008, at Emmanuel United Methodist Church, in Ashland, at noon, with visitation from 10 a.m.-noon. Lunched followed the service at the church. Elmer Denbow was born on 11 November 1891 at Pana, Christian, Illinois, USA. He married Anna Katherine Wolf, daughter of Frank Wolf and Mary Peppinghaus, on 11 June 1915. Elmer Denbow was Methodist. He was buried on 2 January 1972 at Pana, Christian, Illinois, USA. He died on 2 January 1972 at Pana, Christian, Illinois, USA, at age 80. Very fond of his many grandneices and nephews that he'd never met.Gave money to Dad to help with college costs. He died in May 1961 at Arizona, USA, at age 74. Emma Denbow was born in 1879. She was , according to Bonnie Lonsigner, the owner and operator of a restaurant in Woodsfield for many years.2 She married (?) Bayes in 1910. Her married name was Bayes. [S40] Letter, Bonnie Lonsinger to Carl J. Denbow. Emma Denbow was born in 1899 at Monroe, Ohio, USA.1 She married Roy Gray in 1920 at Monroe, Ohio, USA. Emma Denbow married Herb Winland in 1925. Her married name was Gray. Her married name was Winland. Essie Denbow was also known as Essa Pearl Denbow.2 She was born on 8 April 1893 at Lane Twp, Monroe, Ohio, USA.1,2 She was also known as Essie Metz. She married Raymond Clarence Metz on 29 December 1913 at Monroe, Ohio, USA. Essie Denbow married William O. Clay. Her married name was Clay. Etta Viola Denbow was born on 24 July 1881 at Monroe, Ohio, USA. She married William Knoff in 1900. Her married name was Knoff. Etta Viola Denbow died in 1971. She was buried in 1971 at Lewisville, Monroe, Ohio, USA. 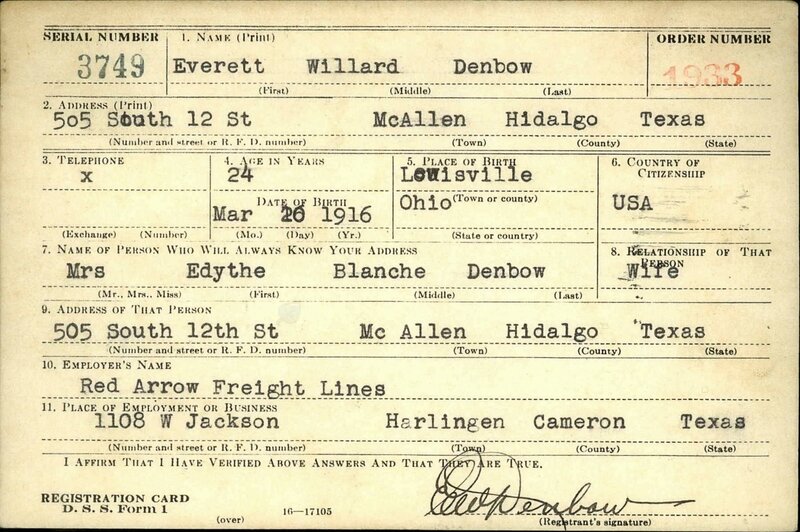 Everett Willard Denbow was born on 20 March 1916 at Lewisville, Monroe, Ohio, USA.1 He began military service on 28 October 1943 at U.S. Army.2 He ended military service on 21 December 1945 at U.S. Army.2 He married Epifania Rivera on 2 January 1974 at Brazoria, Texas, USA.3 Everett Willard Denbow married an unknown person in 1980 at Texas, USA. He died on 22 December 1985 at Houston, Texas, USA, at age 69. [S304] Everett Denbow Death File. Floyd Denbow Sr. was born in 1906 at Ohio, USA. He married Margaret Norman in 1926 at Monroe, Ohio, USA. Forrest Denbow was born in 1879. He died in 1901. Francis O. Denbow was born on 2 August 1860. Frank Denbow was born in 1855. Franklin Denbow was born on 28 May 1880 at Elk Twp, Noble, Ohio, USA.1 He died in 1882. Franklin Denbow was born in October 1895 at Morley Township, Scott, Missouri, USA. He died in 1950 at Morley Township, Scott, Missouri, USA. Gabriel Denbow was born in 1809.1 He DEAT: SOUR @C295@. George Lee Denbow was born on 23 October 1880 at Navarro, Texas, USA. He married Lena Beal on 17 April 1901. George Lee Denbow died on 27 May 1943 at Navarro, Texas, USA, at age 62. He was buried at Corsicana, Navarro, Texas, USA. George W. Denbow was born on 3 October 1875 at Lewisville, Monroe, Ohio, USA. He witnessed the marriage of George Solomon Egger and Cora Ann Denbow on 25 May 1898 at Monroe, Ohio, USA. George W. Denbow died on 1 May 1963 at Arizona, USA, at age 87. Thursday, 25 Jan 1906, Spirit of Democracy, Woodsfield . . . . .
Christ our Savior, that we shall grasp glad hands with him in a world when all imperfections cease, all sorrows fall and where we shall live eternally in heaven. George Denbow was buried in the Braken Cemetery on Monday in the afternoon of January 15, 1906. The funeral services were conducted by Rev. Neeley of Summerfield, Ohio. His remains were laid to rest by his comrades of the Jas. P. Mann Post No. 267 Dept. of Ohio of the Grand Army of the Republic and the Sons of Veterans. The bereaved family and brothers have the heart felt sympathy of their many friends." -- A COMRADE. H. C. Denbow married Eritis Daniels on 3 May 1902 at Blodgett, Scott, Missouri, USA. Hamilton Denbow was born on 25 February 1860 at Monroe, Ohio, USA. He married Ellen Thompson in 1878.1 Hamilton Denbow died on 12 September 1957 at Lewisville, Monroe, Ohio, USA, at age 97. He was buried on 12 September 1957 at Stafford, Monroe, Ohio, USA. Hannah Denbow was born in 1840 at Indiana, USA.